Address: This sale has concluded – Thank You. 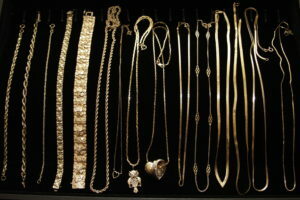 NOTE: All valuables, jewelry, gold, coins and silver are removed daily from the house. 60% OFF SATURDAY! EVERYTHING MUST GO. This is another terrific sale loaded with jewelry, including a gorgeous 18k gold bracelet, two 14k gold nugget bracelets, and over 13 other 14k gold necklaces and bracelets, and many gold charms and pendants, including a 14k gold heart with six bead set diamonds. There are also five 14k gold and diamond rings, a beautiful marquis sapphire and diamond gold ring, 14k gold bands, and 10k -14k gold earrings, including diamonds and sapphires. We also have many loose cut gems, including a gorgeous cut fire opal, rubies, topaz, sapphires and Thai rubies. 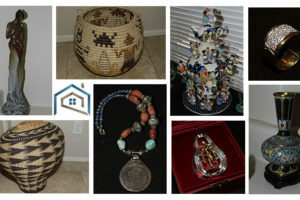 There are also many vintage brooches and other jewelry, including signed pieces,. There is also a vintage 14k gold and diamond Hamilton ladies watch, a vintage Wyler 14k gold watch, and many other vintage watches. There are lots of silver coins including Morgan Silver Dollars, Peace Dollars, Walking Liberty Half Dollars, Ben Franklin Half Dollars, Liberty Dimes and Nickels, and lots of paper money, including red and blue seal silver notes, a 1928 $20 bill, star notes, and a Series 1917 $2 Note. Additionally, we have lots of vintage stamps and stamp sheets, and ephemera, including old newspaper headlines and pinup calendars from the 1950’s. There are some very nice silver plate flatware sets, old silver plate pieces, silver demitasse, crystal vases, candlesticks and bowls. 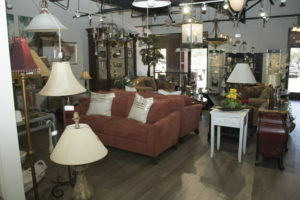 There are many original oils, an original old French hand cut lithograph, and lots of unique decor and collectibles. Also available are two antique pre-1850 clocks, many vintage mid-century modern clocks. You will also find vintage perfume bottles, some miniature. There are also many unique vintage antique items, including an Early electric Hamilton Beach sewing machine. If you like owls there are many-from an owl shaped mirror to vintage metal trinket boxes. We have a Mendelssohn upright piano and lots of music books. Furnishings range from solid Maple bedroom furniture, a beautiful metal and brass queen bed, a brass tea cart, and a glass top kitchen table. There is a 60″ Vizio TV, Sony DVD player, and contemporary furnishings as well, including a TV stand, chairs, a Barrister bookcase, and two very nice desks. We also have vintage audio equipment and many vintage cameras. There are also many unique antique and vintage items, including a compass, telescope an old nutcracker, and much more. The kitchen is also loaded with items from like-new mixers and appliances. There is a sewing machine and table and lots of art supplies from colored pencil sets to acrylic paints and brushes. We also have matting and frames, sketch pads, and much more.